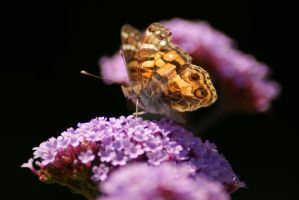 A Peacock Butterfly (Nymphalis io) sitting on a Butterfly Bush. Taken at a local cemetery. Wow, that's so beautiful! Gorgeous shot! Lovely photo! Such beautiful colors! The detail in this is astounding. then it makes it even better, you did that on a windy day?